When, 153 pages into reading Jonathan Sperber’s Karl Marx: A Nineteenth-Century Life (2013), I paused to skip ahead to read the section about the relationship—such as it was—between Marx and Darwin, and to write a blog post about it, I didn’t think that I would be returning to blog about the book again. What else would there be to blog about Marx? But I failed to reckon with the Pythias to his Damon, the Guildenstern to his Rosencrantz, the Stimpy to his Ren: Friedrich Engels. 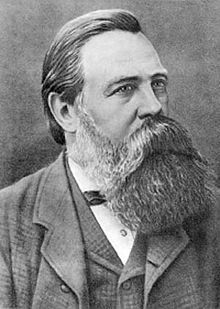 Unlike Marx, “Engels was always a positivist,” Sperber says: he professed a profound respect for scientific method and for empirical investigation. Although he retained “a great piety and attachment to the colossal old boy” (namely Hegel), he regarded the natural sciences as primary, adding a Hegelian gloss only afterward. Marx, in contrast, started as a Hegelian and never totally renounced the approach; Sperber suggests that his mature thought was, on average, halfway between positivism and Hegelianism. If Engels saw dialectical philosophy, in good positivist fashion, as the expression of the natural sciences, he also could reverse the procedure, rejecting scientific findings when they did not fit his philosophical views. Denouncing the Second Law of Thermodynamics, he wrote to Marx: “You cannot imagine anything stupider.” The idea of gradual equalization of temperatures, or, as it would later be formulated, increasing entropy, led to a world “that begins in nonsense and ends in nonsense.” Although the second law was seen as “the finest and highest perfection of materialism,” it envisaged a progressive cooling of the universe. Such a development implied “the original hot condition, from which things cooled off, absolutely inexplicable, even absurd, thus presupposes a God.” Since, for Engels, philosophy included atheism and materialism, and that philosophy was based on the natural sciences, a science that led to a questioning of atheism and materialism could not be science. Great Kelvin’s ghost! I thought. American creationists love misusing the Second Law of Thermodynamics and hate communism: finding a communist thinker of Engels’s stature rejecting their favorite scientific principle because it implies divine creation would be a gift to them. Actually, it’d be a gift to old-earth creationists, primarily. Old-earth creationists, such as Hugh Ross of Reasons to Believe, are enamored of the Big Bang, regarding it as a scientific corroboration of Genesis 1:3: “Fiat lux!” They needn’t accept the exact connection that Engels supposedly discerned between the Second Law and a hot early universe (if not the Big Bang exactly) to feel cheered by his rejecting the former because he feared the religious implications of accepting the latter. Young-earth creationists, such as Ken Ham of Answers in Genesis, are hostile toward the Big Bang, objecting both to the timing (13.8 billion years ago, as opposed to about 6000 years ago) and the sequence of events that followed (e.g., stars, including the sun, form before the earth, as opposed to Genesis 1). So they could castigate Engels for rejecting a scientific principle as important as the Second Law in order to maintain his atheism, but they couldn’t quarrel with him for rejecting a hot early universe. But not so fast. Even on the evidence of the few texts that Sperber quotes, it seems that there’s something fishy about his reading of Engels. How could Engels regard the Second Law as “the finest and highest perfection of materialism” and tell Marx that “[y]ou cannot imagine anything stupider” than it, given that he was a materialist all along? Doesn’t that suggest that Sperber is conflating, on the one hand, Engels’s attitude toward the Second Law and, on the other hand, his attitude toward a supposed consequence of it? When I found the full text of the letter to Marx, conveniently quoted (PDF) in John Bellamy Foster and Paul Burkett’s 2008 article “Classical Marxism and the Second Law of Thermodynamics,” it seemed clear that Engels wasn’t guilty as charged. Foster and Burkett make a good case overall, I think, that “Engels was not challenging the second law of thermodynamics at all—but rather its much more dubious cosmological extrapolation or extension in the form of the heat death of the universe conception” and that such a position was perfectly within the mainstream of nineteenth-century scientific thought. When it comes to rejecting the Second Law of Thermodynamics, only fools would rush in where Engels feared to tread. Which Was the Most Science-Friendly President?